The authors looked at previous studies from the past decade about children and parents' wartime deployment to Iraq and Afghanistan. "When a parent goes away to war, the common typical response is that all children experience stress around that," Davis said. "Most children adjust after a short period of time." Further help may be needed if the stress becomes excessive. Without treatment, children are at risk for behavioral, social and emotional problems. Early childhood distress can even affect brain development, David said. "We want to get them help, support and resources as soon as possible if it appears that a child is not handling the stress as a child commonly would." 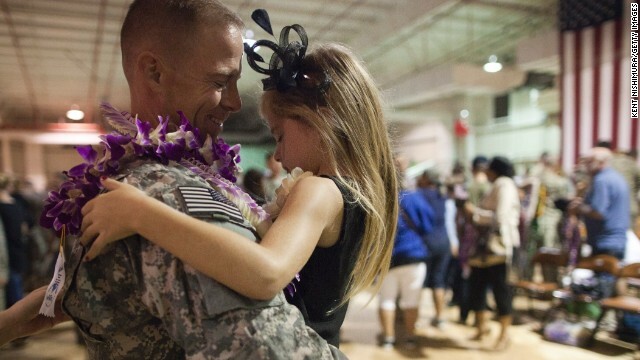 The studies found sadness and worry are common among children when a parent is deployed. One in four children experienced symptoms of depression, and more than half reported trouble sleeping. Both military and civilian pediatricians should be alert for stressors such as deployment on families, according to the report's authors, and should ask if anyone in the family or close community has been involved in wartime experiences, and how the family is coping. Non-military pediatricians care for more than half of military children, experts said. While the research focused on parental deployment, "We definitely think the evidence would apply and extends to important people in that child's life," Davis said. "It could be an older brother." Dr. Elspeth Ritchie has firsthand knowledge of the importance of treating these kids. The chief medical officer for the Washington Department of Mental Health, Ritchie is a retired Army psychiatrist and a former psychiatry consultant for the Army Surgeon General. A pediatrician, she says, is often the "first line" of defense. "Pediatricians often are the first physician or the only physician that a child will see," she said. "So it's critically important for the pediatrician to screen for anxiety and depression, and then if the person is struggling or having difficulties, to refer them to the right person in the mental health system or to the appropriate counselor. " In addition, following up is key, she said. "People express sorrow, fear and depression differently over time. It may be that a child, when young, seems to do OK and it's not until they are older they really realize what's happened, that they are willing or able to seek help for it, so it's critically important for the pediatrician to be following the child over the course of the child's growing up." "Mental health experiences don't just go away or get better," she added. "They take months and they often take years to fully resolve." If we're now acknowledging the damage that deployment does to millions of children and family members, then why not bring the troops home now? Easier said than done. My friend's husband works on moving troops and materials to and from the US. He made a choice to join the Army after the birth of his third child. It was his only option. You have to also recognize that the military is the only option for some unemployed people. Why? Look in your neighborhood, and you will witness the same from non-military families. Your 'bring them home now' logic is good for all broken homes. Had you ever been in military service you might have learned an appreciation of the US military. I would like to know if this reporter even bothered to talk to the US military? We already spend millions every year for this very thing. I work for the navy and navy spends a large amount of money and time just for this purpose. And deployments do not just happen during wartime. The navy in particular sends their members out to sea for 2-6 months at a time, depending on what type of sea going vehicle they are on. I also know that ALL the other services also send their members out on deployments to other countries for anything from months to years. Because of this, the military has a large network of providers who cater to their family members including down to helping them do their checkbooks right. We do NOT need to add more funding to military budgets for this purpose as we have already been doing it for years. What we really need to do is to monitor what those funds are being spent on because I can tell you from the daily perspective of reviewing purchases for the navy that a lot of items the family service centers purchase for these programs is quite ridiculous and if the typical tax payer knew what was actually being paid for, they would say just the opposite of what this story is trying to convey-that we need to spend more. We need to spend less. The family services program is one of the most generous program in the military. Common sense would also dictate that being under sequester and furloughing employees and cutting active duty numbers, we do not want to ramp up a program that is given more than enough funding already. Sequestration has taken a toll on family services, we don't need to cut anymore. What we need to do is spend the money logically. Most military spouses don't need lessons on balancing check books, budgeting, doing minimal car repair, etc. I can tell you that the vast majority of people in my situation need better access to mental health care, we need more support groups, more play groups for our children, and more stress management. Learning how to balance a checkbook is not going to help this Air Force veteran, military spouse of 16 years deal with a 6 month deployment alone with a child with significant special needs, and another child who has typical issues when it comes to deployments. And family services is not one of the most generous programs out there– it's one of the most under-utilized programs, because they don't provide programs that families actually need and want. There is a huge difference between providing a service and being able to use the service. I can provide child care but you will have to schedule it 4 weeks in advance. This does no good for a mom if she is needed at hospital in few hours. I can provide car service to deployed spouses, however I will only derive them on Tuesdays and Thursdays from 1400 to 1530. But don't forget I can provide. I didn't see anything in the story about funding. My understanding was that the people interviewed were advocating that pediatricians and other health care providers become more aware of the mental health issues that children in military families deal with that other families don't. This is especially an issue for the military families who don't live on or near a military installation and who, as a result, use a civilian health care provider. It's really community-based pediatricians (and other professionals who interact with military children, such as child care professionals and school staff) who need to become more aware of the mental health of military kids, and to know the resources that are available to them through the resources you mentioned, to help meet those needs. Thank-you for addressing this little known and little talked about problem. I'm a military spouse, and I have two children. My son is 9 and has a significant form of autism and my daughter is 7. My husband is gone on a 6 month deployment. There are not many programs for military children that address their needs, and there are even fewer for military spouses. This last weekend, I spent the entire time just me and my children, in our home. I didn't go anywhere, because my son's a flight risk. I saw all my friends and family posting stuff about supporting the troops during Memorial Day, many of my friends are local, but I got no invitation to join them. When I complained to my family about the lack of support during this deployment, all I got was– "you have been married 16 years, you should be used to this." You don't get used to this, your children don't get used to this. Especially as an individual augmentee, once your spouse leaves, you are invisible. Your friends disappear, your family isn't supportive, and support our troops and their families is just political lip service. I too was a military spouse. I am now an unremarried widow of a Marine who died of wounds received in combat. I don't say he died in combat because he suffered for 8 years before one too many "accidents" caused by his injuries took his life. So I have the lovely experience of also dealing with the VA. I have worked for the Navy for 25 years, I can't say how the Air Force or the Army spends the funds they receive for family services, I can only speak of my experience with the Navy. I don't want you or anyone else reading my comments to misconstrue in any way that I do not think the family services program is in any way an unneeded expense of having a military because I don't think that. However, as I do work in a financial position for the navy and see how our specific region spends their funds for this purpose, I can tell you that the funds are more than ample and that there is plenty of ways that the funds could be spent more judiciously. The Navy provides a full support system for their families, beyond any other civilian social program that I have ever seen. I too had children with special needs as well as having a granddaughter with autism. The Navy has clinicians and staff on site who are trained and expected to support any and all needs a navy family may have. Whether it be for deployment, injuries, death, transition to civilian life, special needs children, job seeking, moving, how to do your finances, sexual or domestic assault, natural disasters-you name it, they've got it covered. They also have kids camps to deal with all of these topics from a child's perspective. There is also relationship help, how to deal with stress, how to breastfeed, newborn layettes, temporary furnishings when moving, classes, books, videos, etc. Some of these topics are also covered by the Chaplain's office including marriage retreats, suicide prevention, and we also have a casualty assistance program that helps with injured and deceased service member's families. The Navy also provides all this support to the Marines located on their bases. We have a joint Army-Air Force base near here and I do not know what all they provide but I am sorry to hear that where you are, the Air Force does not have what your family needs. My perspective is from just the navy side of the house. I was a spouse, a widow and I am a federal employee that works in the financial department for the Navy so I am also exposed to what is going on with the budget and the effect it is having on all the programs, not just the family services portion. It is not a pretty picture and it is only going to get worse. This story makes it look like the military is not taking care of its service members families and particularly children, which is not true. The military spends millions of dollars already taking care of its families. What the thread of the story should have been, is that the military programs funded to take care of families of service members will also face cuts because when it comes down to it, the military needs to take care of the members first and with more budget cuts looming, the military faces a future where members won't be able to do their jobs properly or safely and their families will suffer as well. If dependent wives think it's bad now, just imagine what it was like during WWII , The Korean Conflict and Viet Nam War when dependents were considered a "pain in the neck" by the military. I would have given about anything for some of the attention dependent wives and children get now compared to what those of us whose husbands served during those terrible years. It's about time dependent wives and families are recognized as being heroes also. Every time we went to a new army post I'd take my younger daughter to the dispensary telling the doctor that there was a problem that I didn't know how to handle. I knew it was definitely related to her daddy's absence and eventual return to the family after a long period of time. Please don't even think of denying today's children the mental health services they truly need. When money is considered the excuse to not give mental health services, when needed, let's cut the wasted money in our government as a means to provide these services. It can make a huge difference to the children of our service men and women who already give so much for our freedom and who return almost mentally and emotionally crippled. For years I taught military kids, great unsung heroes,,there may be money in the budget, but our students never got it. They only got group support or counseling offered by the school. The military, and we are a military family so I am not bashing what I don't know, Is NOT taking care of or own. Why do you think we have people like Trace Adkins speaking up for the Wounded Warrior Project,,a group doing what our govt. should be doing!!! Watch the news this weekend, see how it is taking a year and more for vets to get initial benefits after being injured,,,wake up folks!!!! This exposes a problem that is already known, but fails to provide information on what is being done to help the children of military members. The author should have at least researched where the funding is really going, and why "they think" these children deserve to be forgotten. The scars of war, deployment, death and constant instability are left in these kids, and no one cares. What good is it to have "officials" publicly acknowledge a problem, if they can't admit that they are failing those who have sacrificed everything for their country? A prime example is in the Nation's Capital. When you call to ask for a referral to have your child seen by a psychologist, they say that they're at capacity. This means you have to deal with the insurance, and plead with them, so they can at least consider to cover a portion for an outside provider. And they only allow a certain amount of limited visits. Cross your fingers that your child is emotionally perfect by the 6th visit! If the doctor orders testing, they're at full capacity, therefore your child will not get psychological testing. You will have to go to an outside provider and pay thousands of dollars out of your pocket, if you want to get a diagnosis, and be able to receive the much need services, so that your child does not fail academically, socially, and ultimately becomes more depressed, anxious and falls through the social gaps. The insurance will not cover for outside provider testing, yet the military is at full capacity. I guess they think a free online test might help? This is a joke, and frankly they insult people's intelligence. The truth is that they are misusing the funds, they are lazy in creating alternatives and do not care. Children have to be failing considerably, in order to get some type of help. This means when it's TOO LATE. I spent the first 10 years of my life as an Air Force brat. I loved every minute of life on military bases. However, as others have posted on this discussion board, WW II, Korea, and Vietnam era dependents (that was me) were simply not supported by the military. We were left to our own devices. And, when my dad died in 1969, my mother and I were unceremoniously "dumped" into civilian life. Back in those days, there was absolutely no counseling or other outreach help given to the widow or child. It was a hard transition. I hope that today's military familes are treated better. They deserve all the support available. The problem is not just deployment. We move constantley and my kids are saddend to leave friends and schools. The adjustment to new schools and friends is just that hard. We move while dad is deployed. I completely agree. I have a child on the autism spectrum, and moving has been a nightmare. Our last series of moves started in 2008. We moved from Minot, ND to VA, where we stayed there for 22 months, then moved to OH for 14 months then to FL. We have been in FL for 2 years, but the impact on my child's education has been horrible. He went from being able to do Kindergarten level work to developmentally a 2 year old, he's 9. The education systems are all different, and the only solution that the education liaisons recommend is to either homeschool or sue the school– ever try homeschooling a severely autistic child? And I can't afford to sue the school. It's RIDICULOUS. And every civilian I know tells me– well, just get out; you should have known this; or you get really good services what are you complaining about. Yeah, get out and do what job? Most jobs that are transferrable with military experience are NOT hiring thanks again to sequestration. I signed up for this? Really. I signed up to be a military spouse, I did not sign up to have my kid's chances at receiving a decent education RUINED. And those really good services, as soon as you retire, your spouse dies, or becomes a wounded warrior, my son's autism magically just goes away! Not right to be in the military and have family.. if your career then live in military housing but to leave family behind is why the draft should be here again. what we have now is irresponsible and stupid.. Most military programs for families are aimed toward those with young families, preschoolers and babies. There are thousands of teenagers who have parents that deploy and no resources because groups that want to help, want to do it for the little ones. I'm extremely grateful we live in Ohio as there are programs here for military youth over the age of 8, however they are few and far between. Teen leadership camp and Teen Adventure camp are great, but all the other teen-geared activities are strictly in the state capital which makes it hard for those of us not in Columbus. They have books for dealing with toddlers and preschool kids and deployments(used them the first two times my husband deployed as I had young kids then). Not so much out there for a mom with teenagers. Or for teens themselves on coping with dad being gone a third time in 6 years as a reservist (as most things are geared to active duty families, even in this day and age where reserves deploy almost as often). As the child of a Vietnam vet and the spouse of a Afghanistan/ Iraq vet I have to say that services for military do exist but are either not accessible or relevant to the children who need services. As a spouse I chose this life 15 years ago with the knowledge that war was a possibility. I have one child who was born a few months prior to 9/11. My husband has been home with us a total of 3 years over the last 12 years. The operational tempo has been unprecedented. The older my child gets the harder it is for him to cope with deployments. We often know before my husband returns from deployment that he will be redeployed a few months later. Military spouses often refer to themselves as glorified single parents. Even when our spouses are home they often work very long hours preparing for the next deployment or supporting those who are currently deployed. As my child gets older deployments get harder for him to handle. Military need more support as they grow into teens and young adults but in our experience they have access to less support. Family support groups are geared towards newer military families and therefor younger children are the focus. Teen clubs exist on some bases but the vast majority of military teens do not live on or near the base but most often in the suburbs surrounding the base. I would like to see the military supply more funding for school based programs in school districts that have large military populations. My child's elementary school provided support and mentorship programs for military children but this was school driven with no help from the military. Our middle and high school do not offer any programs for these children who so desperately need something because of lack of funding. Older children need peer centered support that offers a element of fun. These programs are non existent in our area. We have the largest concentration of military in our area in the world and still do not have adequate services at are accessible to our military teens. If we do not have it here then the system needs to be adjusted to work. I chose life as a military spouse but my child and indeed all military children did not choose this life. Military children need quality, accessible mental health support services. They are innocent bystanders who deserve support from their parents, communities, government, and country. These children have helplessly stood by and watched their parents forever changed by war. The least we can do as a nation is to make certain that support is available to heal the unseen and unspoken wounds that these children have had inflicted upon them. This is why I support funding more comprehensive mental health and support services for older military children. All I can say is that when a service person retires it is the family, especially the child(ren), who deserves the medal. I watched my grandson attend four different schools within an 18 month period due to deployments and PCSing. CNN. if you look at this. maybe you should look into what the DoD and Tricare are doing about medical coverage for military children with autism and other forms of disability's and how they are taking away a lot of their therapy, limiting how long they are allowed to get it. dropping children from therapy programs if they are not making progress with in 6 months. only allowing therapy for 2 years and having to get wavers year after that two year mark. putting co pays at military hospitals for prescription for mental health. putting co pays for children to see psychologists at military hospitals. might be of interest for you to take a look. parents are all over the nation are taking action, scheduling protests and writing their congressmen about these up coming tricare changes that affects over 23,000 military dependents. I am really loving the theme/design of your weblog. Do you ever run into any internet browser compatibility problems? A handful of my blog visitors have complained about my blog not working correctly in Explorer but looks great in Firefox. Do you have any ideas to help fix this issue? Aide à la mobilite Pôle emploi, comment se passe l’aide au demenagement ? That is the right weblog for anyone who desires to find out about this topic. You notice a lot its nearly exhausting to argue with you (not that I truly would want…HaHa). You undoubtedly put a brand new spin on a topic thats been written about for years. Nice stuff, just great!